Art Deco is a style of visual arts that was in fashion during the early 20th century. It is characterized by sleek and streamlined forms, bright, vivid colors, and symmetric, geometrical compositions. Stylistically, Art Deco aimed for a contemporary, often luxurious look, using modern materials such as plastics and stainless steel in its decorative designs. One of the key aims behind the Art Deco movement was to enhance the appearance of all kinds of mass-produced, functional objects, like furniture, household objects such as clocks, jewelry, cars, trains, and even ocean liners. Art Deco also influenced graphic design, especially poster and advertisement design. Posters designed in the Art Deco style were sleek and minimal, with bold colors, basic geometric forms, and distinctive typography. The painter and graphic designer A. M. Cassandre was perhaps the most influential Art Deco poster designer and was the first to create distinctly Art Deco fonts, such as Bifur, Acier Noir, and Peignot. Cassandre’s posters greatly impacted advertising design in the first half of the 20th century and he is considered to be one of the great poster designers of the period. 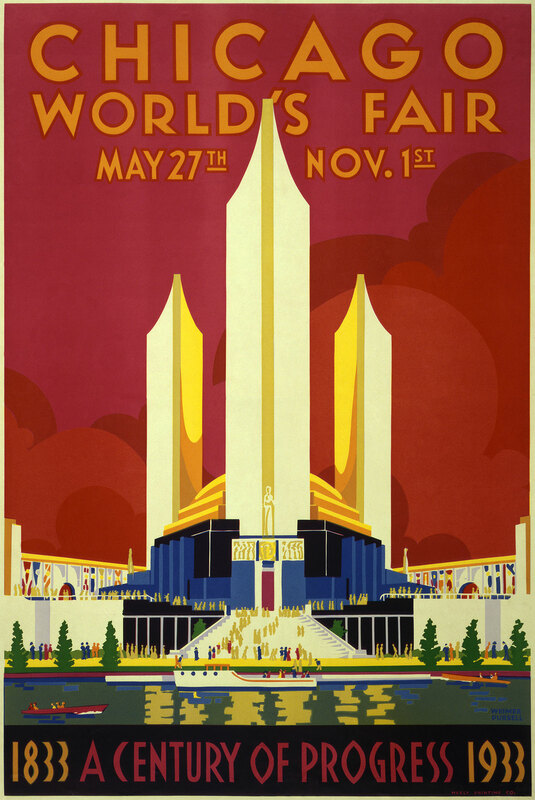 The featured artwork is a poster for the Chicago World’s Fair (1933) designed by Weimer Pursell.